Have you heard the saying that "Diamonds are a girl's best friend?" Well, source citations should be considered a genealogist's best friend. You might think that genealogy documentation or the family tree is most important, but without the source citations, the documentation and therefore, family tree are not worth much. Unfortunately for most of us, genealogy is a passion that sometimes overrides good sense. The mystery of an ancestor, just like a diamond, evokes many emotions. Whether research results are a birth certificate, a tombstone or even a family history, the adventure of the search, the excitement of the find and the consuming obsession to find that next genealogy diamond is overwhelming. Once the genealogy 'happy dance' is done, this passion for finding another genealogy diamond causes many family researchers and genealogists to skip the source citation. Yes, it can be difficult to remember what to record for each type of documentation and the extra copies for title pages, etc. does cost more. These excuses will put you in source citation purgatory - a place where genealogists have reams of documentation, but no source citations to prove them. 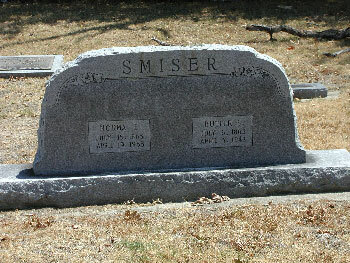 It is a genealogy existential hell and my personal example is this photo of my great, great grandparents' tombstone. This wonderful photo has valuable names and dates, but I have no idea which cemetery it is!! Source: Butler S. and Norma E. Smiser tombstone; Unknown section, Unknown Lot, Unknown Cemetery, Atoka (Atoka County), Oklahoma; photo taken by Melody K. Porter August 2006; GenealogyArchives.com. A diamond would never be accepted without citation of accepted standards (4 C's - clarity, color, cut and carats), a genealogy diamond needs one, too. Without a reference for genealogical documentation, vital components are lost that downgrade the documentation and family history that uses it. Are you a collector of diamonds without sources? Beware. Many of you are thinking, so what? I have copies of documentation or a picture of the tombstone and I know the data was good. However, if you have found a diamond for your documentation that attests to your family data, citations are a must to establish value. You cannot just look at a diamond and know if it is real and the same is true of documentation. Falsifying documentation is not uncommon and genealogy is no exception. Whenever documentation is found, there are three reasons to record the source citation. The 3 C's for providing genealogy documentation standards are different than for diamonds, but incredibly important. They are Confirmation, Comparison and Confidence. Any documentation may seem to provide confirmation or it may even have some items that confirm and conflict. However, years from now if someone else is reviewing your genealogy, how will they know that this documentation is not a fake? If a grandchild wants to use your data for a lineage society or to write a book, they must have a source citation. Confirmation is provided not only by the document, but by the ability of the readers to check out the item for themselves. The standard for genealogy now requires a source citation to validate your claim. Like any diamond, it must be graded to be accepted and the source citation is the grade for genealogy. In addition, there are other reasons for confirmation of sources. How many times have you found a document in other genealogies or online that perfectly corroborates a date or a place in your family history, but you have no idea where it came from? If this has happened to you, then you know the mighty source citation can also be a great time saver. A source citation means that you know where to find this information again and so does everyone else. AND after you have looked it over, you might realize that there is more information to be had from your source. Well, if the source is a mystery, you are at a dead end both for your current document and for any future data it could provide. How do you know what you have? Comparison is an overlooked reason to provide a source citation. Your documentation may confirm a piece of data, but what if more documentation is found that refutes it. Without the source particulars, it will be hard to compare the new documentation. The 4 C's of diamonds are all about comparison shopping and when you have multiple documents with possibly conflicting data, how do you decide which one is more accurate? A source citation is the basis for that comparison. For example, if you have two documents with similar data, only with a source citation for each can you make a assessment on which is more accurate. This is the same judgment that buyers make when comparing diamonds - one is always better than another and that information is imperative in the evaluation process. Genealogists should not forget that they are collectors of diamonds of documentation and they need to be prepared to demonstrate their documentation's worth when necessary. Not all documentation is perfect, but without a source citation, it is at the very least, incomplete. Make your citations as detailed as possible. You can use the MLA format, but genealogy is producing its own set of documentation that is not commonly used in other areas such as for tombstones, quilts, etc. Elizabeth Shown Mills is the source citation guru for genealogy, and has books that give detailed formatting help. Once you have a source citation, the documentation can help confirm data and be used to compare it to additional documentation. Confirmation and Comparison of your documentation are the building blocks for the third C - Confidence. Authentication of your documentation and measuring it against other documentation gives a genealogist Confidence about their family tree. A diamond owner that knows the value of their diamond is proud to display it and you can have that same knowledge and pride in your documentation and family tree by including source citations in your research. Only a researcher who includes source citations in their research documentation can provide the Confirmation, the Comparison and the Confidence to withstand review of the material by others and the opportunity for evaluating new finds. Remember to save yourself from the source citation purgatory that many genealogists find themselves. Just like that girl who proudly wears her diamond, every genealogist should know the source citation is their best friend - so show off by citing that source!